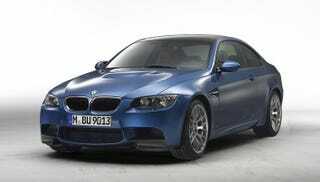 Few refreshes are so refreshing as the one given to the 2011 BMW M3. The front lip is subtly improved, there's a new competition package and it's now got start-stop technology. Hey, at least it's not a hybrid, OK? Squint your eyes and you can see the front lip adds some carbon fiber fangs and the headlights and kidneys appear, at least, to have perhaps the subtlest of reshappenings. More importantly, the new competition ZHP coupe and sedan model adds a slightly lower, upgraded suspension, light 19-inch alloy wheels at the front, and a specially designed Sport mode matched to the new mods. And because it's Europe and carbon emissions MUST BE REDUCED! there's also a start-stop feature tied into both the six-speed manual and M dual clutch transmission. This is said to reduce emissions by 8% or something. But when you're stomping down hard on that 420 HP V8 do you really care?